I'm building a custom child theme using the Twenty Nineteen default WordPress theme as the parent. But the full content of each post is displayed on the blog/posts page instead of just the excerpt. 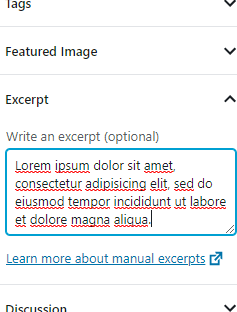 What is the proper way of adding/using excerpts in the new Gutenberg editor? the_excerpt(); // Echo the excerpt directly. $excerpt = get_the_excerpt(); // Store the excerpt in $excerpt. // and instead comes directly from the database. Not the answer you're looking for? Browse other questions tagged excerpt block-editor blog-page or ask your own question. How do I filter the excerpt metabox description in admin? How to show only manual / custom excerpts? How to show post content before read more tag (excerpt) for password protected posts?